iOS 7 was released yesterday and Apple servers went crazy: lots of our readers have had issues upgrading, activation problems (like myself). 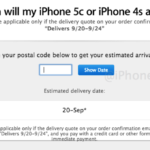 But what was the rate of iOS 7 adoption more exactly? Did the release had some connection with the internet traffic running at 112%? Philip Elmer-Dewitt of Fortune has the numbers. With the help of a widget posted by Mixpanel, a mobile analytics company, we can have a more precise rate at which iOS users have decided to upgrade to Apple’s latest mobile operating system. 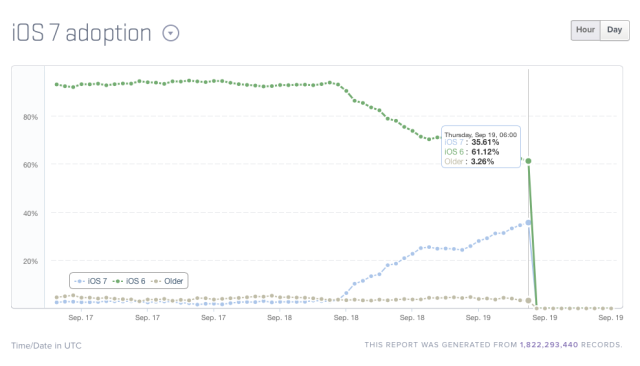 Before sharing the numbers, here is a little background: as of September 18, the vast majority of the nearly 700 million iOS devices were running iOS 6 (93%). 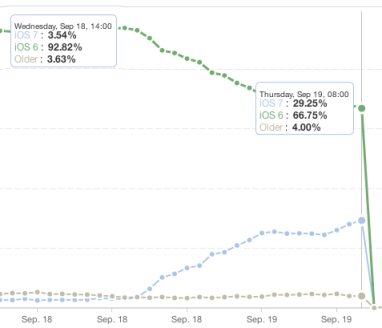 Just 16 hours after Apple released iOS 7 to the public, more than 29% of those devices were running iOS 7. As Dewitt points out, this means 100 million downloads, or 6.3 million downloads per hour, and considering 1.2 GB per iPhone download and 1.3GB per iPad, that’s nearly 2.2 terabytes per second. As of writing this article more than 35% of iDevices are running iOS 7. 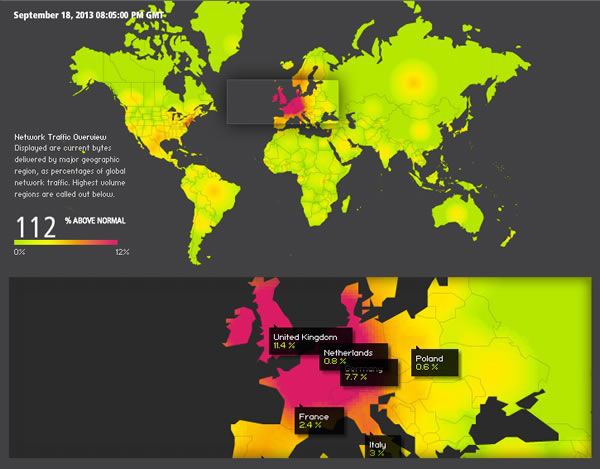 If we consider that the hotspots pushing internet traffic 112% above normal level was in countries like the United States and the UK, where the iPhone adoption is the highest, yeah, iOS 7 download has had its share in the internet going crazy.